Reduce the risk of damaging your belongings during transportation with this Hyper Tough Moving Blanket! It features a rugged, zig-zag sewing construction with a double-lock stitch. This thick quilt provides protection for your furniture and appliances. It's large enough to wrap around most furniture. 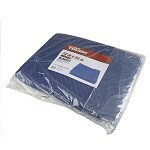 This 72" x 80" moving blanket can be reused multiple times and even for protection during construction projects. It can also act as a protective layer for items that are kept in storage for indefinite periods of time. This furniture moving blanket is used by professional packers to mitigate any risk of scuff, dirt and moisture from damaging your possessions!